Once you have been accepted into the Oblate Formation Program, you will receive the official Oblate Booklet: Pax – With the Gospel for our Guide which is produced five times a year: Advent, Lent, Eastertide, Post-Pentecost 1, Post-Pentecost II. This booklet gives you the direction to follow on your journey. It is divided into 8 sections. 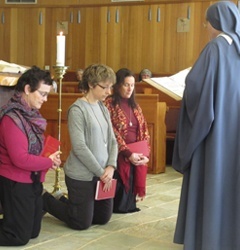 Reading and Reflection: Sr. Hildegard (Director of Oblates) directs Oblates to the sections of the Rule which are recommended at the time the Pax Booklet is planned or to reflection on monastic values and practices. Further Reading and Reflection: You will be directed to reading which focuses on the particular chapters of the Rule which are being studied at the time, or reading which supports the monastic theme put forward for reflection. Liturgy – the liturgical calendar for a particular period of time. Saints – the lives of saints and holy people and the wisdom they offer us. For reflection – excerpts from monastic writers and other writers which support the theme of each edition of Pax – With The Gospel for our Guide. The period of formation for an Oblate is 12 months or longer. If, after 12 months, you feel ready to make your Oblation, you are required to write to the Director of Oblates and ask to do this. She then refers your request to the Abbess. Oblate Meetings are held on a Saturday, four or five times a year. The meetings are not obligatory but are provided as a prayerful support in our journey together as Benedictines oblates. They consist of prayer, instruction and sharing. The dates for the meetings are forwarded to oblates with every Advent Pax Booklet. Advent begins the new Liturgical Year, hence the notification of all that concerns oblates for the following year is forwarded in the Advent Booklet. Oblation Ceremonies are made in groups, once or twice a year. The dates are chosen in accordance with community commitments and will be confirmed by the Director of Oblates at the beginning of each year. The dates usually coincide with the Oblate Retreat Weekends when oblates come to our cottages for a few days of companionship, prayer, study, sharing and reflection. When you feel ready to make your Oblation you need to purchase an Oblate medal for your ceremony. This can be purchased from the Abbey Shop or the Books Gifts Dept (contact details above). You also need to choose a new name – that is, a saint’s name or a name significant to you, which can be inserted after your own Christian name. Once you have chosen your name, you can let the Director of Oblates know when you are celebrating your annual feast day. While there is only one feast of St. Hildegard (September 17), there are three or more “Gregorys” in the liturgical calendar. The cost of packaging and posting the Oblate Booklet is $25.00 per year. You can send this to the Director of Oblates, either by mail, or via our Guest Mistress.